This year, I’m homeschooling three kids (grades 1 to 5) while keeping a two-year-old and a baby out of the books. 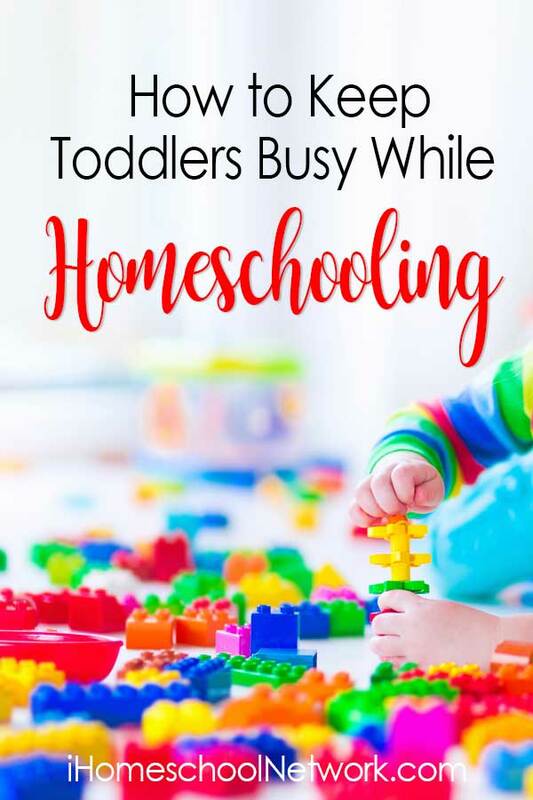 As a homeschool mom, it’s not always easy to juggle schoolwork for older kids with nap time and playtime for younger kids. Here are some practical ways to keep toddlers busy while homeschooling. This post contains affiliate links for books or products I’ve found helpful and recommend here. This year, I reorganized our homeschool area. Now we have a cube-style bookshelf for our homeschooling materials. The top row of shelves holds the girls’ textbooks, encyclopedias, and workbooks. The bottom row of shelves holds cubes with toys for the younger two. I’ve tried to find toys that appeal to a wide age range for these cubes, so that they are safe (mostly) for the baby yet also of interest to my older girls. Keeping a few toys with our homeschooling materials makes it easy to keep the younger two busy. I try to only pull out one cube at a time. Pearl (age 2) has to clean up any toys from one cube before she pulls out another cube. Currently, the four cubes hold wooden blocks, baby toys (which Joey has almost outgrown), Marble Works (without the marbles unless baby is napping), and play dough and modeling toys. Having the kids’ toys in these cubes also lets me rotate them. For example, I can put the wooden blocks away for a few months and put a different toy (Playmobil or Hotwheels) in that cube for the kids to play with. When I switch the toys again, they’re happy to see “new” toys (or ones they haven’t played with for a while). I can also change these toys for life seasons; e.g., put away the Marbleworks until the baby stops putting things in his mouth. Play dough has often been my go-to for keeping a toddler busy. I usually make my own play dough (because my toddlers have a tendency to eat it). I keep a few colors on hand. Often, when Pearl has the play dough out, her older sisters will start playing too. It’s easy to clean up, yet offers hours of fun. And as your toddler transitions into preschool, play dough can be used for educational activities, like shaping letters. Most of one shelf in my homeschool cabinet is dedicated to coloring books. We got a new set of markers just before the school year started. Pearl and Jade (age 5) have both done a lot of coloring this year. It’s good for developing fine motor skills, pencil grip, hand-eye coordination, and the ability to sit still. It also lets Pearl feel like she’s doing what her big sisters are doing, because she’s sitting at the table working like they are. Pearl also enjoys tracing stencils. I have a set of alphabet stencils and a princess stencil book. She’ll carefully trace the shapes and figures with a pencil or marker, and then proudly show me the picture (whether or not it looks anything like the stencil!). She can also color the stencil page once she’s finished it. Self-inking stamps are another great way to keep toddlers busy while homeschooling. I’ve tried using traditional stamps with my toddlers, but found that patting the stamp pad and then the paper is a bit too complicated (and messy) for this age. Instead, those little stamps from the dollar store that ink themselves work great. Pearl had a bumblebee stamp for a while, and now she calls any little stamp like this a “bumblebee.” She’ll fill a page with stamps and move on. Stickers are a slightly more expensive version of the stamp, but another useful activity. I bought a variety of stickers at the dollar store to put on the older girls’ workbook pages for a job well done. I ended up giving most of the stickers to Pearl for craft activities. After we threw out a few pages that she’s stuck stickers to, I started having her make bookmarks and cards. She’ll carefully peel stickers off a sheet and arrange them on a piece of folded card stock. Then I have a card to send to grandparents, often with a matching bookmark! My older three girls are great at helping out with either the baby or the toddler. Often, if I need to do school with Jade, I can ask one of my older daughters to “babysit” for fifteen or twenty minutes. The girls can build towers for the baby to knock over or play peek-a-boo until I’m free again. They are also good at reading stories to Pearl, who currently loves Sandra Boynton books. These books have adorable pictures and fun rhymes, and often Pearl can participate in the story. A friend gave us two large bins of MegaBlocks when my third daughter was born. These have been one of the best toys we’ve ever owned. My 10-year-old and 8-year-old still play with the MegaBlocks when they are out. (I rotate them in and out of the closet regularly.) They’re safe for the baby to play with too, so I’m not worried about having them around. And they can be used as learning tools. For example, I’ll build towers with Pearl, and ask her to hand me blocks with two or three on them. Never underestimate the power of food to keep toddlers busy while homeschooling! It’s a common joke that homeschoolers are like hobbits, eating first breakfast and second breakfast and elevensies and lunch. That’s certainly true around my place. It takes me a minute to make a sandwich that will keep Pearl occupied for ten minutes (or longer if she starts feeding it to her baby brother…). I try to keep my pantry and fridge stocked with easy, healthy snacks like grapes, apples (just slice and add cinnamon! ), fishy crackers, applesauce cups, cucumbers, etc. Just make sure the school books aren’t in arm’s reach of the high chair! When my oldest was a toddler, I swore she’d be screen-free. Now that my fourth is a toddler, she can turn on my tablet by herself and find her favourite apps. I do try to limit her tablet time to those minutes when I really need her quiet and busy (like when the baby is napping, or when I need to do a math lesson). I’ve been super impressed by what she’s learned from Starfall and Reading Eggs, her favourite apps. She’s almost three and can already count to ten and say her alphabet. 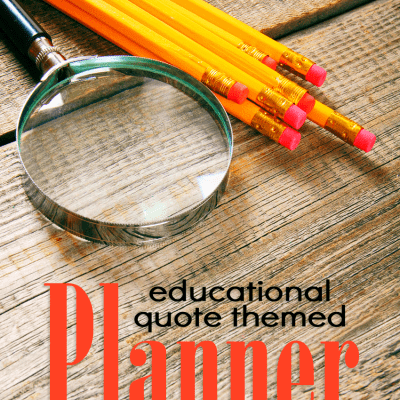 I hope these ideas help you in your homeschool endeavors. How do you keep toddlers busy while homeschooling older children? Bonnie Way is a stay-at-home-mom with four daughters ages 9 to 1. She has a B.A. in English (2006) and a B.A. in Writing (2014). She has been blogging since 2006 and seeks to encourage and support other moms. When she's not blogging or homeschooling her oldest daughters, Bonnie can be found reading, rock climbing, or drinking coffee with a friend.